Once again comes a tragic reminder that human spaceflight is a dangerous process involving forces and speeds so great that if anything goes wrong, the crew may not escape with their lives. At 207,000 feet above central Texas, space shuttle Columbia - the oldest in the fleet - began to fragment. Slowly at first, small chunks broke off the fuselage. Then came a bigger explosion, and yet more fragments fell to Earth. One thing seems clear. It was an accident not a terrorist incident. It could have been a failure of the heat-protection tiles that exposed parts of the shuttle to re-entry temperatures it could not withstand. It could have been an explosion in the aft section that damaged the tail causing the shuttle to fragment. To determine what happened, Nasa will want to gather all the fragments and piece them together. 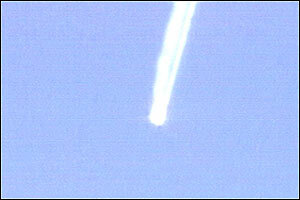 It will also analyse in detail the images of the fragmenting fireball falling to Earth. One thing seems clear: it was an accident not a terrorist incident. Columbia was on a routine, mostly scientific mission - space shuttle mission STS-107 - intended to carry out a series of biological, medical and physics experiments. In its 113 launches, the space shuttle has failed only twice. In itself that is a good record but it is still high when translated into everyday terms. The death of the crew will have been quick and will, like Challenger, be hard to bear. If the same statistics applied to everyday travel then anyone who drove their car to and from work once a day would be lucky to live to the end of the month. It brings back the first space shuttle accident, that of STS-25 in January 1986, when seven astronauts died in an explosion just 80 seconds after blast-off. The current loss is quite different. Take-off is the most dangerous phase of the mission, closely followed by re-entry. The shuttle fleet will be grounded while what happened is investigated. But the pressures to fly again as soon as possible will be immense. The orbiting International Space Station depends upon the space shuttle to ferry crew to and from it and transport supplies. If the space shuttle is unavailable then Nasa managers will have to look at its near-term future. An alternative would be to use Russian rockets but they do not have the capacity and many western analysts wonder if they could be relied upon given the economic climate there. It seems unlikely that Columbia will be replaced and running a space shuttle fleet of just three spacecraft will force a reappraisal of what the fleet is able to do. The loss of Columbia will be a wake-up call to the politicians and the public to take a more realistic view of manned spaceflight - it is dangerous and people will die in accidents. That has always been the case and, despite the Challenger accident, many had forgotten it. To seasoned engineers and astronauts, such accidents are inevitable. The conquest of space sometimes demands a high price.